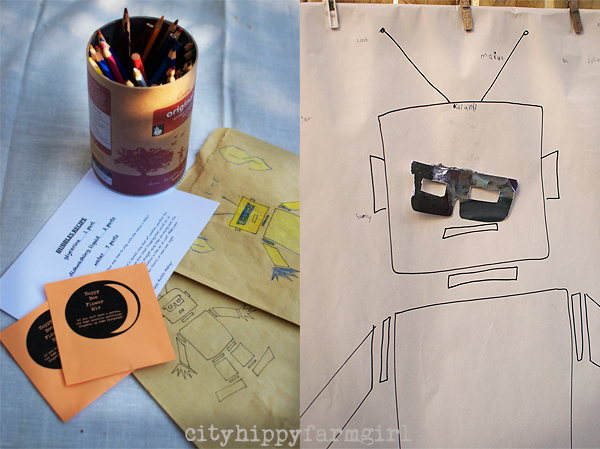 This entry was posted in Food Glorious Food and tagged birthday, children's birthday cake, environmentally friendly, kids, parties, robot, simple birthday ideas by cityhippyfarmgirl. Bookmark the permalink. Thank you Jane, you kind thing. Love love love those green thoughts. Happy birthday Monkey. Oh eek Celia, I can’t believe it either! 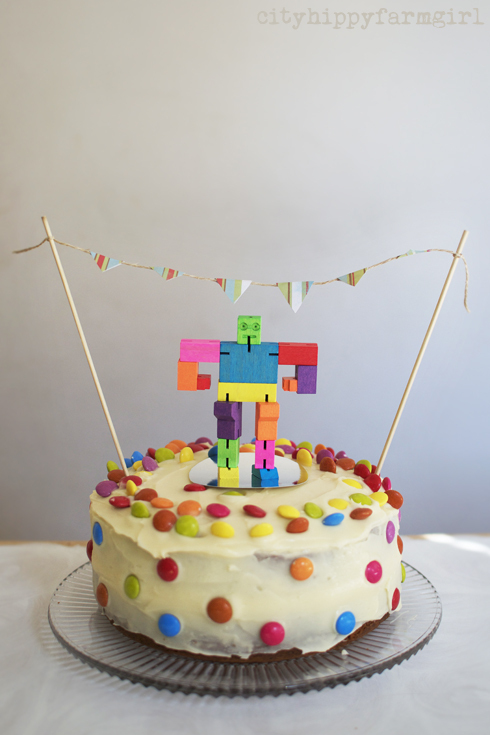 Great cake- he is very symmetrical in his candy placement- and that robot is so cool! 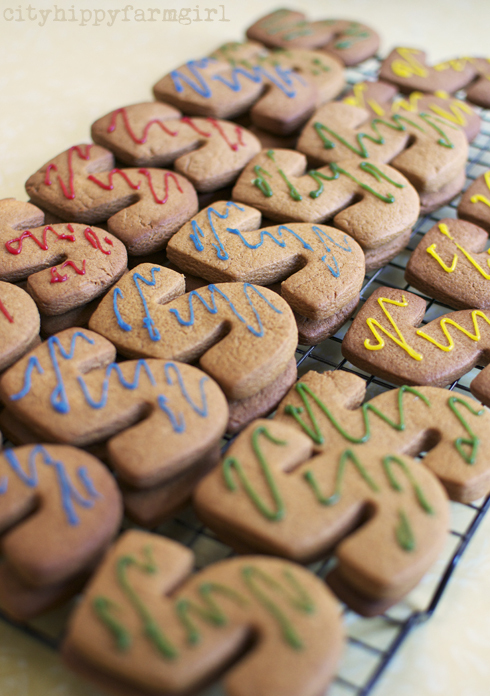 5 is a great age- fun and smart and helpful and ready to explore the world! Thanks Tandy, yes the biscuits didn’t last long. Happy 5th b-day to your little Monkey! Lovely party, and happy birthday to your little boy! I read an article a while back about a study done on childhood development and children who can delay gratification tend to be much more intelligent than those who need the sweetie, or whatever the “bait” was, immediately. Sounds like your little monkey must be very bright, to be able to plan and wait a WHOLE year. 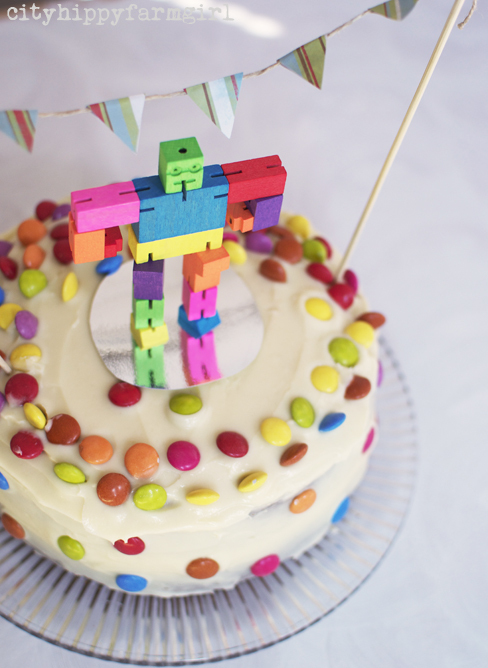 His cake is lovely and that party sounds just perfect! He’s actually quite patient for a little fella, he still surprises me which I love. Looks like a such fun party! We have a birthday coming up as well for one of the kids 🙂 Good Job! Nothing like a green party hey. The first 5 years go past like greaased lightning don’t they. My eldest was 5 on August 8th and he too helped me t bake his cake. He’s also planning his 6th birthday already but I’ve evaded the how many days question by saying it’s a week after Daddy turns 47 which he hasn’t asked how many days until. 🙂 Happy birthday to Mr 5. Good to hear I’m not the only one dealing with those questions 🙂 He asked again last night how many days until his birthday….sigh, LOTS!